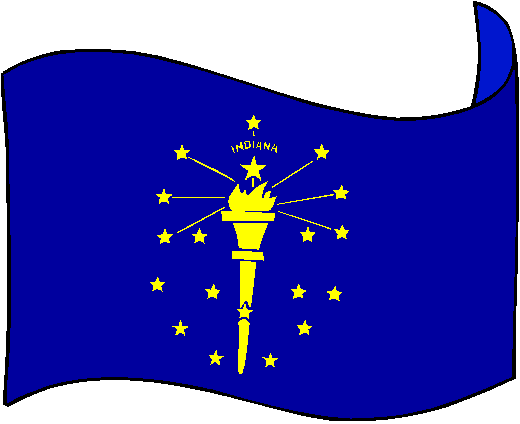 The flag of Indiana consists of a gold torch on a blue field. The torch represents liberty and enlightenment and rays emerging from the torch represent the far reaching influence of liberty and enlightenment. The torch is surrounded by an outer ring of 13 stars (representing the original 13 colonies), an inner loop of 5 stars for the next 5 steps to join the Union, and one large star above the torch, to represent Indiana, the 19th state to join the United States. The flag was originally designed by Paul Hadley of Mooresville, Indiana, in a contest sponsored by the Daughters of the American Revolution, and adopted by the Indiana General Assembly in 1917. This 3x5' lightweight Polyester Indoor/Outdoor Flag has 2 metal Gromments for easy mounting & a Canvas Hem for long lasting strength. Featuring sharp vivid colors, this flag flies beautifully to showcase your state pride. Also looks great on display in your home. High Quality US State Flags - 100D 3x5 Polyester Flags. This product is imported to USA and contains 100% polyester fiber.